If there was one thing you could do to improve your health, increase your energy, prevent chronic disease and help you lose weight, would you be interested? What if I told you all you have to do is eat more fruits and vegetables? Fruits and vegetables provide us with a whole host of disease fighting nutrients. They also help us with energy production and weight loss. Fruits and Vegetables provide us with all the vital nutrients our bodies need to be healthy. Each one specializes in its own set of nutrients that’s why it’s important to eat a variety of different fruits and veggies. For instance, cruciferous vegetables like broccoli, cauliflower and kale have certain nutrients that help you lower your risk of getting cancer. 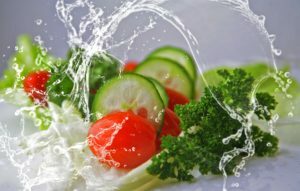 Green leafy vegetables are a good source of many vitamins and minerals like iron and calcium. They prevent certain types of cancer as well as improve heart health. Citrus fruit will not only help you fight against colds and flus but also provide fiber, hydration and are packed with potassium which may lower stroke risk. These fruits are also good for our skin. Did you know that eating a lot of vegetables is also linked to longer life span? A new study, published in the American Journal of Clinical Nutrition, based on data collected from more than 71,000 Swedes, aged 45 to 83, and who were followed for 13 years found some interesting data. They found that people who had reported eating no fruit or vegetables at the start of the study were 53 percent more likely to die during the follow-up period than those who got their daily servings. Participants who ate at least one serving of fruit daily lived 19 months longer than those who never ate fruit, on average. And those who ate at least three servings of vegetables per day lived 32 months longer than people who reported not eating vegetables. Fruits and vegetables help with weight loss in two different ways. The first is the fiber content of fruits and veggies makes you feel full. Due to their lower sugar content, you won’t experience the ups and downs of energy that you get from high sugar foods and that helps you with your craving. The combination will assist you to naturally control calorie intake and lose weight. The second way deals with the Energy systems of your body. These vital nutrients act as the enzymes (catalyst) for the break down of our proteins, carbs and fats into smaller units of energy. It’s this process that allows your body to use carbs and fat for fuel and provides you with more energy. The USDA recommends between 5-9 servings of fruit and vegetables per day. That seems to be the range that most organizations agree on and it is a good number to aim for. Use a ratio of 3 vegetables to 2 fruit if your close to ideal body weight and are trying to maintain. So how many servings of fruits and vegetables do you typically eat per day? Be honest. Not up to 5, that’s ok! My hope is that I’ve given you a few good reasons to make fruits and vegetables a priority in your nutrition plan. Getting your daily recommendations of fruits and vegetables could be the most important part of living a healthy lifestyle. If you’re not getting the 5 servings you need every day, start by adding one extra serving. Maybe you can add a fruit with breakfast or a serving of vegetables with dinner. Once you’ve decided, work on consistently adding this serving until it becomes a habit. Here are a few strategies that I use or have used in the past. Maybe they’ll help you out too. 1. Breakfast smoothie – Fruits, veggies and a blender and you’ve got a quick and healthy breakfast. 2. Veggie Omellette – Great way to start the morning – packed with protein and veggies. 3. Prep and cut into small baggies for snacks – Save time and do this all at once and you’ll have a quick snack you can grab at any time. 5. Have a salad for dinner – There are so many different types to choose from, pick the ones you enjoy the most. 6. Haves fruit with yogurt and/or cottage cheese – A healthy fruit and protein filled snack. 7. Fruit after workout or light snack before – A great way to provide energy or start your recovery. 8. Eat small frequent meals through out the day. This will provide the many opportunities you need to get vegetables into your diet. Add a serving of a fruit or vegetable with every meal. By adding more fruits and vegetables into your diet you’ll make a positive impact on how you look and feel. You’ll naturally increase your energy and create less cravings. At the same time, you’ll also be boosting your health and immune system. So aim to get 5 servings per day. PS – If you didn’t catch the first part of this Nutrition 101 series you can read it here. It sets the foundation for a good solid nutrition plan.